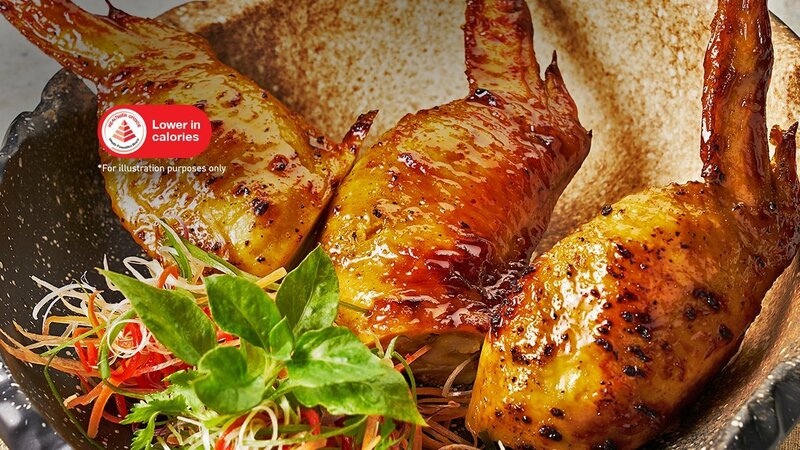 Serve up a sumptuous plate of grilled chicken wings, minus the calories. Seasoned with KNORR Concentrated Chicken Bouillon and sweetened with KNORR Rock Sugar Honey Sauce, these wings are a treat for taste buds and waistlines everywhere. Clean and debone the chicken wings. Then, marinate the chicken wings with salt, white pepper and Knorr Rock Sugar Honey Sauce and set in chiller for at least 2 hours. In a mixing bowl, mix the minced chicken, garlic, red chili, carrot, shiitake mushroom and egg white till well incorporated. Marinate the minced chicken mixture with Knorr Concentrated Chicken Bouillon, salt and pepper. Place the minced chicken mixture into a piping bag and pipe the mixture into the marinated deboned chicken wings. Steam the chicken wings for 10 minutes. Set aside and let it cool. When the chicken wings are cooled, grill it over charcoal fire and glaze the chicken wings with Knorr Rock Sugar Honey Sauce every once in a while. Grill the chicken wings till cooked.